What I am about to write will either shake a belief of yours or bring immense relief. I hope for the latter. When I started working with people who felt stuck in their jobs yet didn’t know what to go for instead, I noticed a certain tension in them whenever we started talking about finding their passion. I asked what that tension was about and many told me that the idea of needing to find that one passion feels super scary for them. It was like taking one candy out of the box not knowing if it was the right one. Plus, when they add the feeling of being pressured by the society to know what their passion is and follow it no matter what ... Now, that completely blocked them. Statements of people around us like “What do you want to do with your life? You should know what you want by now, don’t you think?” don’t help either. Can you relate? That you should know by now what you want. That you need to find that 1 passion that will feed you for the rest of your life. MYTH #1: YOU SHOULD KNOW BY NOW WHAT YOU WANT. When people around you say such things, what they are probably trying to say is that they care about you and that they are worried. Worried that you will not be happy and end up stuck in a job you don’t like. Yes, I know, coming out of their mouth it sounds like a judgment, a demand, a reproach. Yet behind every harsh word normally lays a wish for better. Here is what you can do about it right now: Think about how do you want to respond to people when they say “You should know by now’. Think of a response that will make you feel you are in charge of your own life. You don’t need to answer to anyone for respecting your own timing. Write the statement down and try it out with a friend. 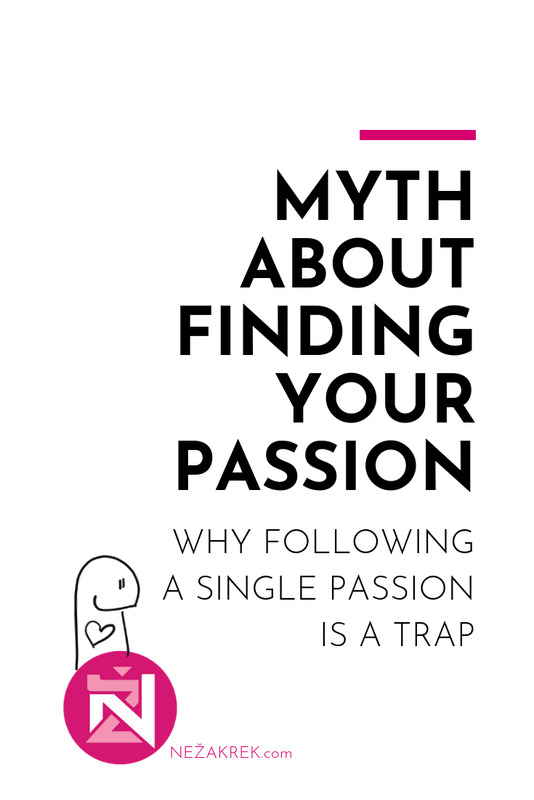 MYTH #2: THAT YOU NEED TO FIND THAT 1 PASSION THAT WILL FEED YOU FOR THE REST OF YOUR LIFE. Or else you will live an unfulfilled life and forever wander around the job market. Lost. Unhappy. Blablabla! There is no such thing as 1 single passion! There is a multitude of passions that fill your heart with joy depending on the day, project or period in your life. The passion that will be your muse in that particular time depends on the things you learn, on the people that inspire you, on the opportunities, your life lays out for you. Let me share my story as an example. First, what you need to know is that I was always a veeeery curious being. There was even a time when my family called me Why instead of Neža. True story. To a large degree, I am no different today. Difference? I learned to own it. Now look at your list and put on your laser vision (I know you have on). Full disclosure: this is a portion of my passions list. As you can see, the ‘passions’ are only a portal to get you thinking what are the elements you are going for. If you put on your list Project Management, I bet there are things about it that give you energy and others that drain you. Get clear on what are they. Join my newsletter and you will be getting this type of practical stuff delivered in your inbox every week. Leave your name and fav email below and I will send you a Career Change Kit for curious women for you to start this really important journey towards a career that makes you happy straight away. How will you celebrate your achievements this week?